I’m not one to make a big deal about birthdays, in fact if Charlotte didn’t remind me I’d probably forget my own, but earlier this year I turned 40 which is kind of a milestone. Considering the average life expectancy, 40 is about halfway to the finish line for most people. Naturally this is a good time to reflect on the past and plan for the future. For me it’s easy to reflect on the past since this website acts as a sort of journal, although I haven’t kept up with it as much lately like I used to. As for the future, I thought it was time to make some goals and resolutions, kind of like New Year’s Resolutions except for the next 10 years instead of 1. I have many plans, goals, ideas, and bucket-list items, but the main “part 2 of life” resolution I have is to simply enjoy life more and value each day as an opportunity to do something meaningful. As we all get caught up in our daily routines this can sometimes be hard to remember. Focusing on the fundamentals in life can bring you back to the real world. I’ve learned over the years that the fundamental important elements in life are family, friends, education, wisdom, health, and great life experiences. Some people put value on material and earthly things like money, career, possessions, appearances, fame, and social status. Money, career, and possessions are necessary to a certain degree, but the last three are highly questionable. The balance between these intangibles and tangibles in life is a delicate matter. Focusing on one or the other will give you vastly different outcomes and meaning in life. It’s up to each individual to decide how much weight each one deserves. Charlotte often suggests that I am a paranoid pessimist. I do have a creative mind and often imagine every possible outcome of a given scenario, good and bad. If only that was a marketable skill… Of the many doomsday scenarios my mind conjures up there are inevitably situations where we lose all of our possessions and have to start over from scratch. This could come about as the result of a natural disaster, alien invasion, asteroid impact, nuclear attack, or from dozens of other variables my mind thinks about. Of course we would conveniently be elsewhere when this happened, but the end result is an interesting hypothetical situation to ponder. If we lost all of our possessions (tangibles), what would we still have? Most items can be replaced, but it would no doubt be difficult to start over again with nothing, and you would lose some personal effects. On the other hand it would be refreshing to suddenly be rid of lots of baggage that has accumulated over the years. With this in mind we’ve been waging our own war on stuff by selling some of our old unused items online. Every time there is a community garage sale we participate with a healthy dose of our junk that might just turn into someone else’s treasure. Sometimes it takes getting a few dollars for an item you aren’t quite ready to let go of, to give you the extra motivation and justification to set it free. We’ve also donated quite a bit to the Salvation Army and Goodwill. It’s surprising just how much we’ve made from selling some old stuff, for example we sold a digital SLR that we used for a few years and recovered about 75% of what we paid for it. Cameras hold their value surprisingly well. That money went towards our new camera that we are enjoying today. Charlotte and I lived out of our backpacks for 6 months when we traveled across Europe and the USA so we know it is easy (and sometimes not), to get by on the bare necessities. You do miss the not so little things, like a refrigerator or washer/dryer, but you learn to adapt. Ironically when you have less tangible possessions to worry about you start to focus on the intangibles at hand more intently such as family, friends, education, wisdom, health, and memories of great life experiences. I suspect that in old age, if given the opportunity to make it that far, when you reflect on your life that these things will be the ones you consider to be the most important. With our war on stuff over the last few years we are downsizing our lives to live a freer lifestyle, and to get our finances in order so we can focus on the experiences we value, rather than getting stuck in a never ending loop of consumerism. I believe many other people are coming to this realization as well. We have a long ways to go yet. I have a weakness for electronics and sports equipment, while Charlotte is fascinated with boots, clothing, and enjoys dining out. Nevertheless I think we are heading in the right direction and making good progress. One life experience that I enjoy, which unfortunately takes some money and certain possessions, is skiing and snowboarding. For me the sacrifices made to have the feeling of standing on top of a beautiful mountain and riding down pristine snow is totally worth it. 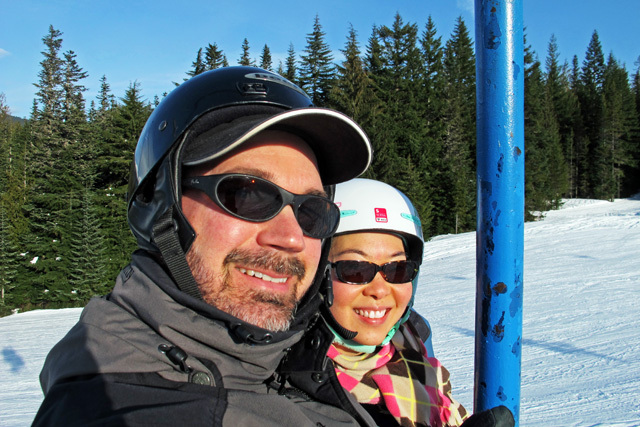 This year Charlotte got back on the mountain and went snowboarding with me at Mt Hood Skibowl. I also hit the crazy deep powder on Crystal Mountain in Washington for the first time (14 feet just in the month of March). 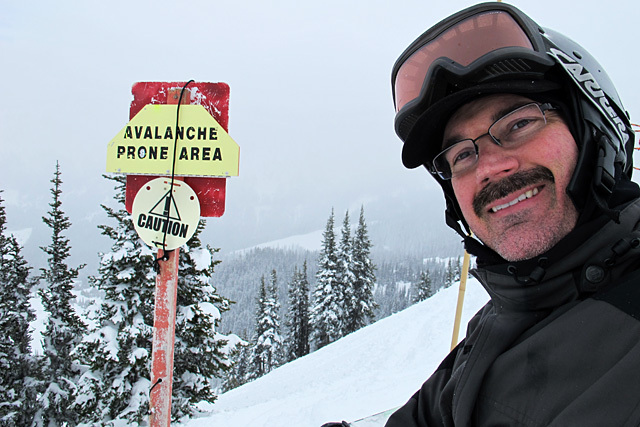 Of course as I turned 40 I couldn’t help but reflect on a great trip to Whistler last year with my buddy Todd who had just turned 40 at that time and had an interesting perspective about it. He said he was celebrating all year, not just one day, or one week. This became the inspiration for me to celebrate each day as important and meaningful. Todd and I talked about traveling as we often do and so the thought of us at such a magnificent place skiing/snowboarding for pure recreation while many in the world do not have clean drinking water or food did cross my mind. In the U.S.A. and other first world countries we have it super easy. Maybe things haven’t been great for some folks since the great recession started, but I guarantee that out of the 7 billion people on this planet, just about everyone in this country is in the top 10 percentile of comfort, luxury, and opportunity. If you have ever visited a 3rd world country and witnessed the conditions that the majority of the world’s population live in then you will understand. For people living in those conditions the intangibles are much closer to their hearts, because in many cases that is all they have. Some of the best things in life are free, or cost very little. A few I can think of are good conversation, stargazing, gardening, reading, camping, fishing, hiking/walking, going to the beach, lake, or mountain. 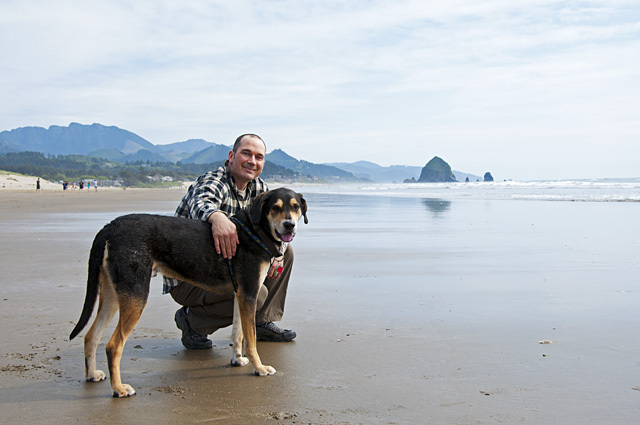 One thing I make sure to do every day is to take a walk with my best buddy Mulder. Rain, shine, or snow, we are out there walking. Sometimes we even go 2 or 3 times per day if possible. Unless we have some other doggie activities planned the walk is the best time of the day for Mulder, and sometimes for me too. I know this because of his crazy enthusiasm every time we walk, and when it’s a family walk with Charlotte he is especially excited. He doesn’t realize it but he is making us happy too. Many times we could easily just laze around and do nothing, but once we are outside on the walk everything is better- even in the rain. Sometimes in life you need a push to do something simple and intangible like taking a walk with your best bud or significant other. Other times you have to find the motivation within yourself to do these intangible things. At the end of part 2 in life it just might be these intangibles you remember most.